June 2001--Another busy month, practicing sounding out words and listening games. I went to New Orleans to be on a parents panel at an audiology conference and met another little girl with AN. Jake is still a busy little bee, talking up a storm. He is into the "repeat everything that brother says" phase and is driving poor Josh nuts. But, he is learning new words and repeating sentences correctly, so it isn't all bad. We are also busy getting the programs and nametags made for the AN conference. Jake enjoys helping to make the gift bags for the other children! 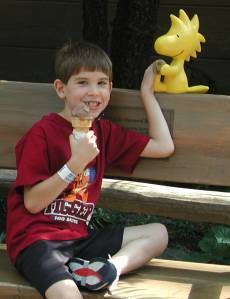 July 8, 2001--Jake was having cortical testing today at Mayo Clinic to see how his brain is reacting to hearing through the implant. I had bribed him that I would give him ten dollars if he completed the test. He had started to squirm around and I said, "Jake, do you want the ten dollars." He sat there a minute and said, "Mom, I need a twenty." Everyone thought that was very funny! The good news was they said his brain waves looked like a hearing childs brain waves! Jake is making good progress in all academic areas. He is a developing reader, reading at the 11-12 level and is building a sight vocabulary of functional words. He is using word attack skills on new text with less teacher support. He is beginning to read beginning to read loud enough to be heard in small and large group settings in the classroom. This shows that he is gaining confidence in himself as a reader. We are observing him using more consistency in using capitals, punctuation, and spacing appropriately on written work. Jake seems to be more confident as a writer, often writing three or four sentences on a topic. He is using resources available in the classroom like the desk dictionary, word wall, and vocabulary around class to help him in using words correctly. Jake has mastered all first grade math skills for the first semester. November 6, 2001--WRITING SAMPLE: Write about two hens that get caught in the rain. Two hens play with the umbrella. Then two hens put a coat on. Two hens ran into the barn. They ate dinner. November 26, 2001--WRITING SAMPLE: My Thanksgiving holiday was long. I ate potatoes and peas. I played gameboy a lot. I like pumpkin pie. I like Mom too. December 5, 2001--WRITING SAMPLE: December makes me happy. December is fun. Christmas is on December 25. Santa is coming with presents. December 12, 2001--WRITING SAMPLE: I am younger than Josh. I like to play with Josh. I think Josh is smart. December 17, 2001--Jake wrote the sweetest letter to Santa. I wish love for everyone. I wish for friends. January 9, 2002--WRITING SAMPLE: When it snowed I played with the dog in the snow. I had a snowball fight with Joshua. January 29, 2002--Write about Polar bears: Polar bears are good swimmmers. Polar bears eat seals. Polar bears live in the Arctic. Polar bears have furry paws to keep them from sliding on ice. February 5, 2002--WRITING SAMPLE: February makes me think of cookies. February makes me think of love. It makes me think of President's Day. February 15, 2002--I gave Jake accessories for his Gameboy for valentines day, the car charger and electrical charger to save his batteries. This is what he wrote in his journal...too funny! My favorite Valentine surprise was a game-boy. Mom gave it to me. The name is Charger. My Mom gave me chocolates. February 26, 2002--WRITING SAMPLE: Gila monsters are black and pink. Gila monsters are venomous lizards. They live in deserts. March 19, 2002--WRITING SAMPLE: I am afraid of bees. I am afraid of bees because they sting. The bees are in North Carolina. April 2, 2002--WRITING SAMPLE: Spring break was fun to play with Shelby. I love to watch Tom and Jerry. I went camping with my family. We saw a big fish under the water. The Easter Bunny gave me candy. I played with eight friends at home. April 12, 2002--WRITING SAMPLE: The whale shark is the biggest shark. They eat big fish. The whale shark has rows of teeth. Scientist like to study whale sharks. The great whale shark eats humans. May 17, 2002--WRITING SAMPLE: Tell about your field trip to the zoo. At the zoo, I saw a grizzly bear. The flamingo has pink feathers and long legs. I rode with Josh on the tram. The fish were looking at me. I saw 20 geese and they were flying. I saw a balck snake in the grass. I had fun at the zoo. May 20, 2002--Jake has been having problems staying focused and sitting still at school, especially in the last few months. It has gotten progressively worse and a few weeks ago the SLP told me that she had to tell him to sit down twelve times in one thirty minute session. TWELVE times!! It is definately starting to affect his work as he doesn't always finish his daily work and has to do it at home or in resource with the TOD. It takes forever to do his sentence writing at home because he can't stay focused. We usually both end up crying before it is over. He also told me that he has a really hard time sitting still at schooland doesn't like having to go sit in his desk at circle time. We went to the pediatrician today to discuss this and we decided to try medication to help him focus better. He thought it was a good idea too so he doesn't get in trouble as much for moving and wiggling. I hated to think of having him on meds, but we have struggled with the fact that he may have ADHD like his brother and that he may have to try meds at some point for well over three years. Still, seeing ADHD written on his medical chart was hard. I know how Josh struggles with the energy levels and the feelings that people make fun of him because he can't sit still.